The story of the Parker Classic begins in 1967 with Parker releasing a new high end ball point pen known as the International Classic to complement their high end fountain pens, followed by their Parker Lady in 1975 which was the same pen offered in Lacquered finishes, although the Parker Lady name was discontinued in 1981 the model continued on as the Classic. In 1986 Parker decided to introduce a fountain Pen to the Classic line up keeping the slim lines and same arrow clip used on the ball pens. 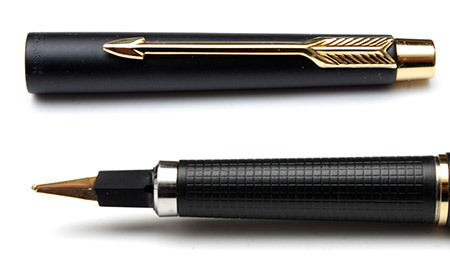 The long nib was similar to an earlier design used on the Parker 180 which had also had a long flat triangular nib although on the Parker Classic the nib was gold plated steel. Various colours and finishes were produced including gold plated bodies, matt finishes as well as lacque finishes and of course a steel flighter. The Parker Classic fountain pen eventually ceased production in 1994 although the ball point pens appear to have carried on for longer. Recognisable from the textured shell section grip the neat arrow with it's side clip fixings into the cap and of course the long thin triangular nib and its boxy black plastic holder. The nib is quite easily removed for either cleaning or to change nibs by simply pulling the nib and feed out. 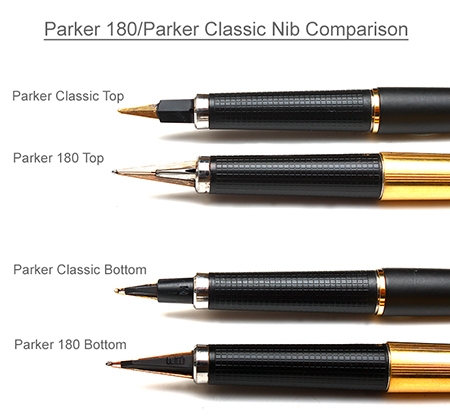 The Parker 180 and the Parker Classic Fountain Pen are often confused with each other due t their many similarities. Both are very slim with a long slim nib. 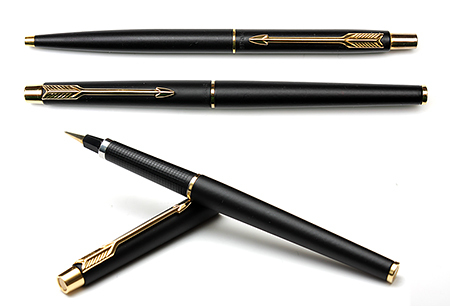 The Parker 180 measures in at 132mm, the Parker Classic at 135mm with a slightly longer clip screw on the pen top. The main visible difference is the nib. The Parker 180 has a long thin double sided nib, either F/B (Fine on one side and Broad on the other) or X/M (Extra Fine and Medium) marked on the bottom of the nib. The nib is unshrouded with the sides visible all the way back to the chrome collar of the shell grip section.